A few years ago, Laird Herbert, a native of British Columbia who works as a college instructor in a remote part of Canada’s Yukon Territory, found himself paying a small fortune in rent. The situation was untenable, and it proved the creative spark behind Leaf House, the modest company he founded to build equally modest but eminently livable trailer dwellings. 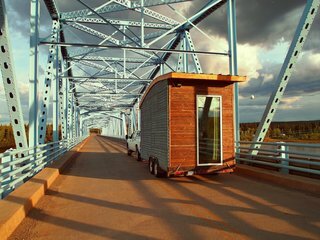 The Leaf House is a lightweight, mobile trailer that was carefully engineered to weigh less than 5,000 pounds. The designer, Laird Herbert, used a metal-mesh, open-joint rainscreen as the cladding on the front end, and spruce pine at the back. 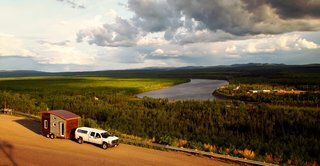 "We’re kind of unique in that, in Canada, a lot of the northern territories get a lot of cash from our federal government, so there’s a lot of good jobs, housing prices are pretty expensive, and rent is often really high," he says. "I’d been in the territory a few years and had been paying really high rent for pretty shoddy northern housing. I had construction experience and I decided that, instead of putting all this money into rent, I’d try to build a tiny house and see where it went from there." The structure is super-insulated, making use of quad-paned windows and vacuum-insulated panels. Where it went from there was three iterations of the Leaf House trailer, each of which Herbert built himself and lived in. 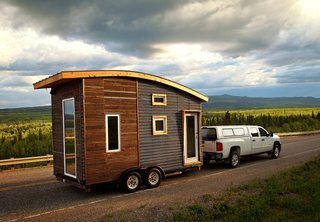 The latest version is a super-insulated, 97-square-foot statement in efficient, small-space living that is also easy to move, thanks to carefully selected materials and furnishings that kept the overall weight below 5,000 pounds. A super-insulated envelope and a heat-recovery ventilator help keep the Leaf House comfortably warm, even in the brutally cold Canadian winters. The 16-foot-long structure was built with vacuum-insulated panels, quad-pane windows, and a Lunos E2 heat-recovery ventilator, which uses the heat in the outgoing stale air to warm cold air that is being drawn in from the outside. 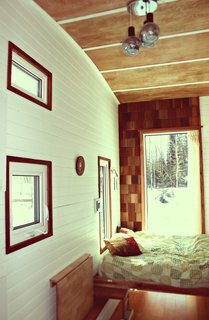 Highly efficient radiant heaters help keep the Leaf House warm in the bone-chilling Yukon winters while holding monthly utility bills in check. 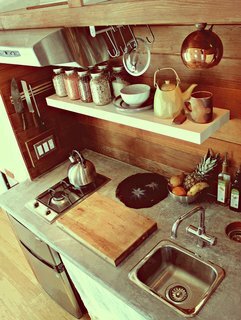 Herbert fashioned the custom kitchen countertop from a foam-core backer board, which he coated with a concrete microtopping. The wood is clear-grain cedar. Herbert acknowledges that trading a larger, more conventional living space for the first version of the Leaf House wasn’t easy. "It was a big adjustment," he says. 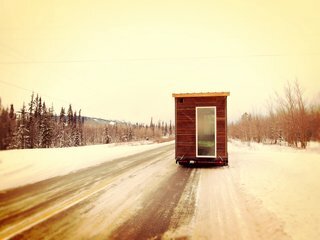 "I think one of the appeals of tiny-house living is it’s kind of a romantic notion. You have this really small space, you don’t need a lot of stuff, and you can pack up and move pretty quickly. But I think there are downsides that have become pretty apparent after having lived in them for almost half a decade, and that’s why I’m interested in building a bigger one." Herbert says the next version of the Leaf House is likely to be somewhere closer to 400 square feet—a size that he says allows for more flexibility and a wider range of living configurations. 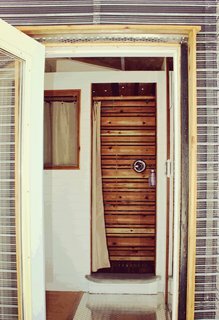 A custom Murphy bed occupies the rear end of the trailer, next to a wall of cedar shingles. The wall at left, which Herbert painted white, is tongue-and-groove pine. 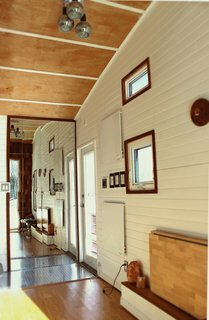 For now, however, the third version of the Leaf House might be a good option for anyone looking to downsize, reduce their carbon footprint, or simply experiment with a more mobile living arrangement. Herbert used laminate bamboo flooring inside the Leaf House. An inexpensive light fixture, which Herbert found in a thrift shop, hangs from the birch-plywood ceiling. Herbert charges $26,000 to $50,000 per house, including material costs that run from $19,000 to $40,000. He builds the houses himself, a process that takes four to six months. For this reason, he says he is not taking new orders until further notice. However, he is still selling the plans for the second version of the Leaf House on his website for $150. The shower, as seen through the main entrance. The metal-mesh open-joint rain screen is designed to rust over time. "I’m booked up for at least a couple of years—backorders and stuff," he says. "I’m not at the point where I want to do large-scale production. Part of it for me is really enjoying the custom, more unique parts of it. It’s more of a passion for me, rather than trying to do four or five of them a year." "I like the more boxy, modern look," Herbert says, "and I think it fits the small space better. You have more space in a box. As soon as you put a peak on a roof, you lose a lot of that usable space."